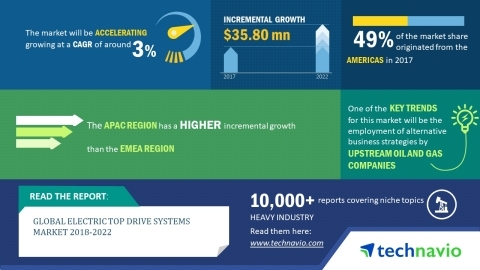 The global electric top drive systems market research report by Technavio predicts the market to post a CAGR of around 3% during the period 2018-2022. A key driver for the global electric top drive systems market is the increase in demand for oil and natural gas. According to the US Energy Information Administration, the global liquid fuel consumption increased by 7.16 mbpd in 2016 when compared with 2011. The crude oil prices decreased to USD 27/bbl in January, which led to an increase in fuel consumption due to the decreased prices. This global electric top drive systems market research report provides an analysis of the most important trends expected to impact the market outlook during the period 2018-2022. Technavio classifies an emerging trend as a major factor that has the potential to significantly impact the market and contribute to its growth or decline. The oil and gas industry has been through a challenging phase owing to the low crude oil prices along with weak demand from across the world. Several oil and gas companies found it difficult to cope up with the losses during this phase. Therefore, there was a decrease in exploration and production activities in 2014-2016. “There are several business models and strategic approaches being employed by the oil and gas companies to increase profitability during the low crude oil phase. It includes assessing the economic viability of the oil and gas projects in addition to increasing the crude oil output. The fiscal regimes of a country, operating agreements in terms of tax regimes, production sharing contracts, and cost-recovery mechanism must be assessed in detail,” says a senior research analyst at Technavio. This electric top drive systems market analysis report segments the market by application (onshore and offshore) and geography (the Americas, APAC, and EMEA). The onshore segment held the largest electric top drive systems market share in 2017, accounting for nearly 69% of the market. This application segment is expected to dominate the global market throughout the forecast period. The Americas led the market in 2017 with more than 49% of the market share, followed by EMEA and APAC respectively. The Americas is expected to dominate the market throughout the period 2018-2022.